The Perfect Pie Crust Recipe requires only 5 ingredients and yields enough for both bottom and top crust. This Pie Crust is buttery, flaky and is perfect for sweet or savory pies. I’ve been baking my own pies for a long time now, but I still remember a time when I used to shy away from making my own pie crust and used to buy the store bought ones. 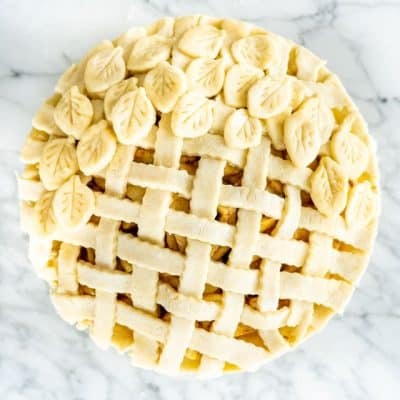 While there’s nothing wrong with store bought pie crust, I enjoy making my own because it’s so easy and quick and using this basic recipe, it always turns out perfect. The great thing about this pie crust is that is so versatile, it’s perfect for both savory or sweet pies. You can use it to make custard pies, cheery and apple pies, pumpkin pies or even quiches. Always use very cold butter or any other fat such as shortening or lard. This is the secret to a flaky crust. I always cut my butter into small pieces and chill it in the freezer for about 15 minutes prior to adding it to the recipe. Don’t over knead the pie dough, especially once your transfer it to your work surface and work the dough with your hands, as your hands could melt the butter. Start off using the minimum amount of water (6 tbsp). You basically want to add enough water just until the dough starts holding together when pinched between your fingers. Always chill the dough for at least 30 minutes and up to 2 days, which makes this crust perfect for make ahead. While working with the second piece of pie crust, chill the lined pie pan, this will help it keep its shape when baked. This pie crust is perfect for blind baking for when you’re making lemon meringue pies or pumpkin pies. 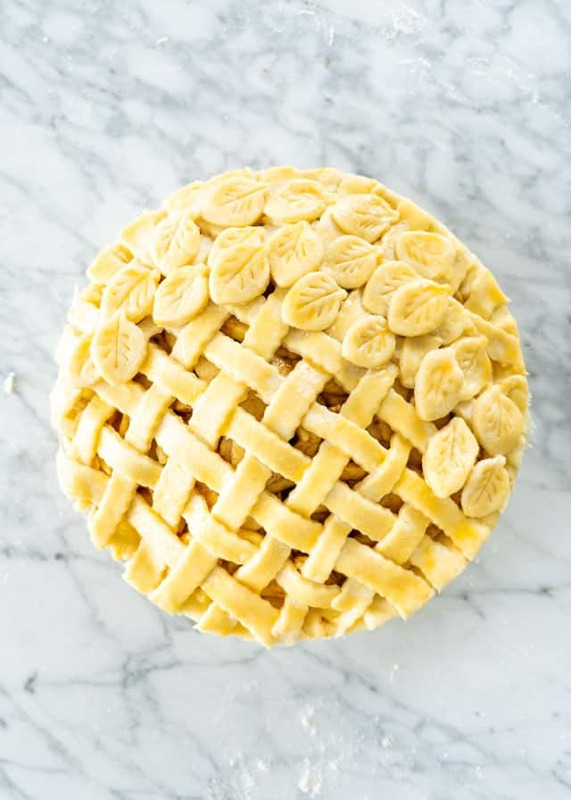 Blind baking basically means baking your pie crust before filling it and baking the entire pie and it’s necessary for when you’re making a custard pie or the pie filling is unbaked. If you’re making this pie crust for blind baking, this recipe will yield 2 pie shells. Heat the oven to 425 F degrees and make sure the oven rack is in the lower-middle position. Follow the steps as outlined in the recipe below for making the pie crust and transfer it to your pie plate as normal, then trim the edges and crimp. Line the pie with parchment paper and fill the pie with weights. You can purchase pie weights or you can use beans or rice. However, make sure the weights cover the entire bottom of the pie. The weights will keep the pie from puffing up and the sides from sagging as the crust bakes. Bake for 12 to 15 minutes or until the edges are golden. Remove the pie weights by grabbing the corners of the parchment paper and lifting the weights out of the pie. Since the bottom of the crust will still be uncooked now, you need to return the pie crust to the oven and bake for an additional 5 minutes. Fill with your favorite custard or filling and you’re done. Add the flour, sugar and salt to a food processor and pulse a couple times to mix. Add the butter to the food processor and pulse several times until the pieces of butter are pea size. Add the ice water. Start with 6 tbsp of water (no ice cubes) and pulse again. Pinch the dough and if it doesn't stick together between your fingers add the rest of the water, a tablespoon at a time, until the dough just begins to hold together. Transfer the dough from the food processor to a clean work surface and use your hands to form into a ball. Do not over-knead. If you over knead you start melting the butter with your hands and the dough starts developing gluten which means tough dough. Cut the ball into 2 pieces and shape each piece into a disc. You should still see pieces of butter in the dough. This is what will make your dough flaky. Wrap each disc in plastic wrap and refrigerate for at least 30 minutes or up to 2 days. Remove the dough from the refrigerator, and let it sit at room temperature for up to 10 minutes. This is required to soften the dough a bit, so that you can roll it out. Roll out each disc using a rolling pin. If your dough is sticking to the surface or to the rolling pin add a bit more flour as necessary. Roll it until it's about 1/8 of an inch in thickness. Place the pie dough lightly into a pie plate. I usually roll it on the rolling pin and unroll it over the pie plate. (see video) Crimp the edge and cut off excess dough. Add your favorite filling to the pie. Roll out the second disc. 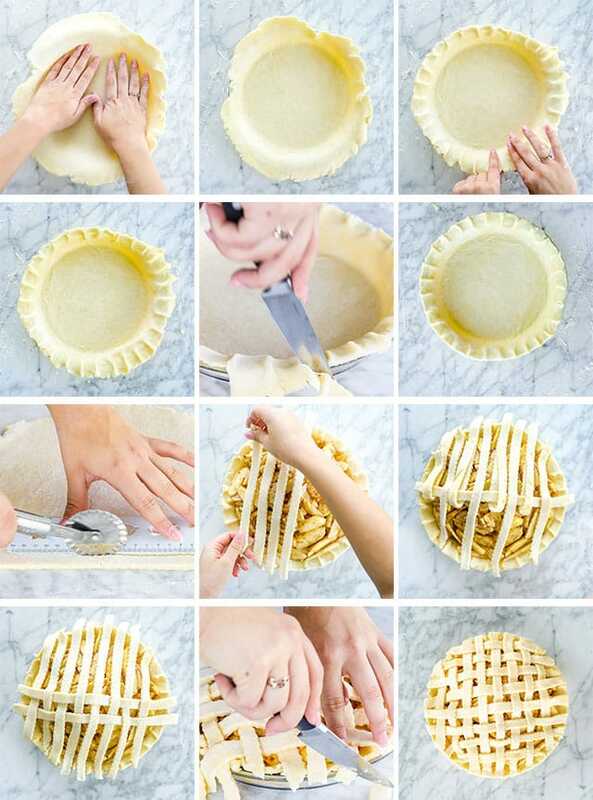 Gently place on top of the filling or cut into long strips to make a lattice. Trim the excess dough, if needed. If making a double crust pie, make vents in the top pie crust if necessary using a sharp knife and brush it with egg wash, if preferred. Bake the pie for 1 hour at 375 F degrees or until the crust is golden and starts to brown. You can also combine some vegetable shortening into the crust, for example 1/2 cup butter and 1/2 cup shortening. No food processor? 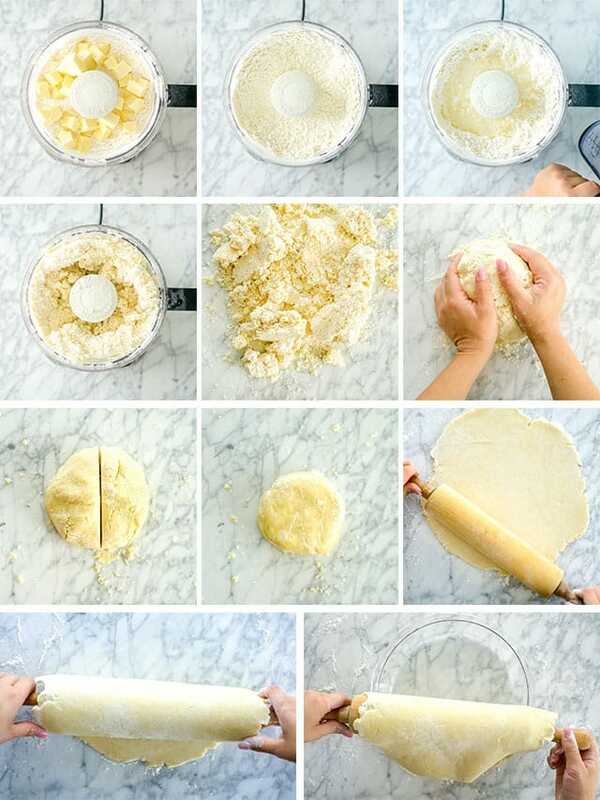 No problem: If you don't have a food processor, you can use a pastry cutter to cut the butter into the flour. 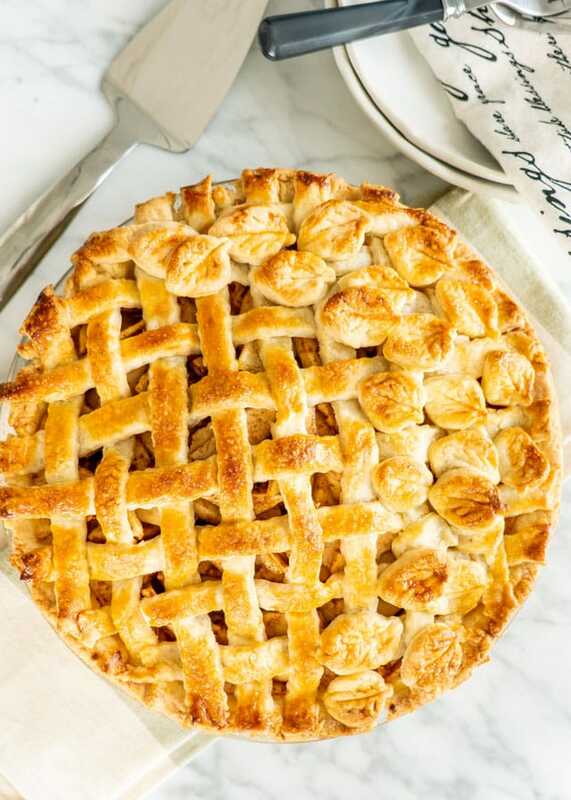 Freezing the pie crust: Place the pie dough in a freezer bag and freeze up to 3 months. When ready to use it, thaw the pastry overnight in the refrigerator. You can also freeze a baked pastry shell. 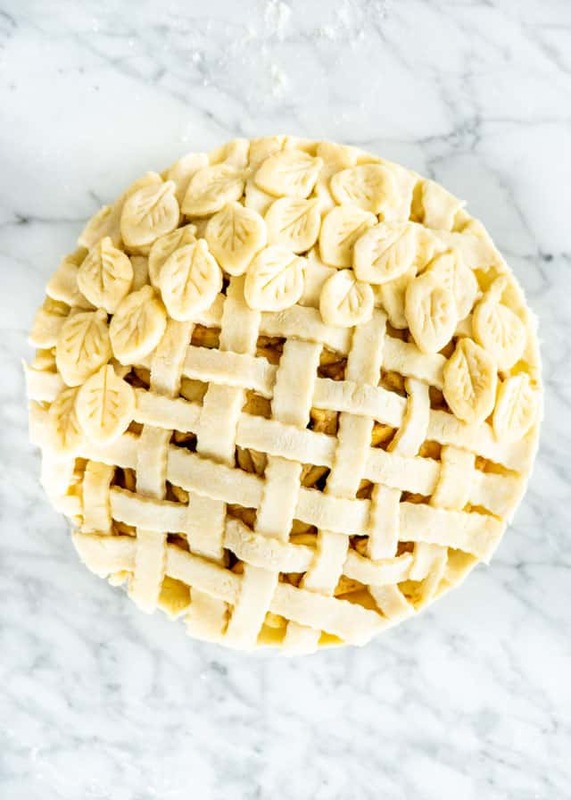 (see the blind baking notes in the post) Cool the pie shell completely before transferring it to a freezer container or bag and freeze up to a month. Thaw overnight before using. Thanks Rachel! So happy it turned out for you! Baking in the oven right now. So easy, didn’t even bother to get the food processor out! I used deep dish pyrex and had zero left over pastry. can’t wait to eat it. Thanks. Would it be ok to use pastry flour instead of all-purpose? Can’t wait to try your recipe. Yes you can, it should give you a really tender crust. This looks delicious, and I might try it this weekend! one question though, it would be a dessert for our annual family bbq, so I need to make quite a few. Can I roll out the dough and fill the trays and store them in the fridge in advance? i don’t see myself rolling it out before baking. Or should it be better to make them in the morning and heating them slightly up later on? Yes you can do that! They’re always best freshly baked, so storing the uncooked pies in the fridge until you’re ready to go is a good idea. Thank you Nicole, for your answer. i’ll let you know how it worked out! We’ve enjoy a few of your recipes now keep it up! Some useful tips that I do when making pie/tart crusts. Put the butter in the freezer for 15 min or so prior to using. Chilling the flour in the freezer doesn’t hurt either. The colder you can keep the ingredients, the better the crust turns out.